I’m not sure who you trust, but I hope it’s not a musician. 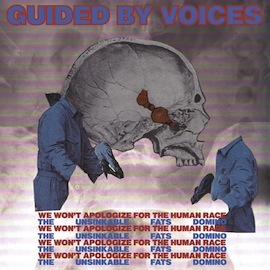 Chalk Robert Pollard’s Guided By Voices up as the latest group to renege on their promise not to reunite, not to tour, and not to record as their original (or, in the case of GBV, “classic”) lineup. But if this is what being lied to sounds like, then by all means, keep deceiving us. “The Unsinkable Fats Domino” is the first single to be released from Let’s Go Eat The Factory, the first record in fifteen to be recorded by the same GBV configuration responsible for classics Bee Thousand, Alien Lanes, and Under the Bushes, Under the Stars.